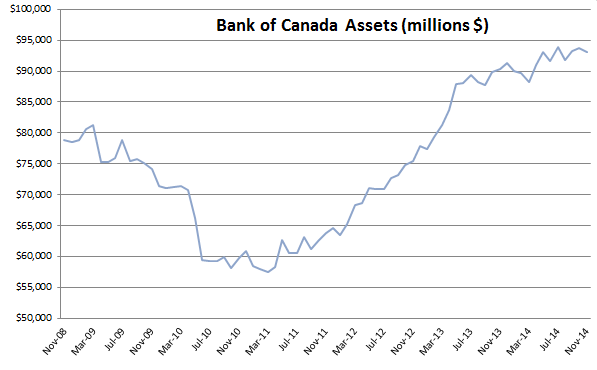 What’s Going on with the Bank of Canada’s Assets? 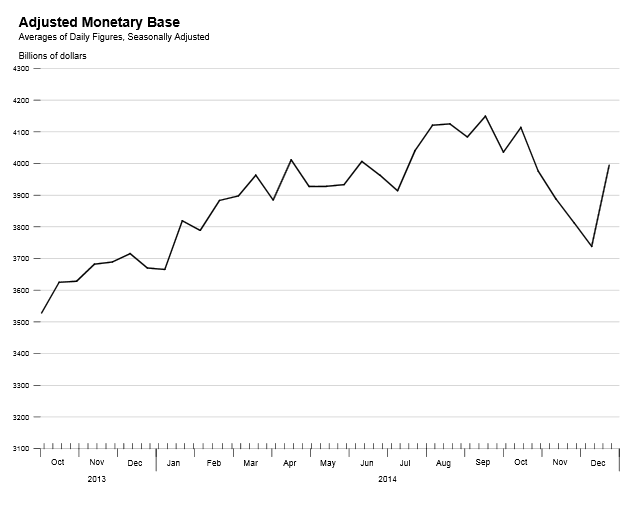 It looks like the Bank of Canada is slowing the growth of the monetary base. So a slowdown, or flattening, of the BoC’s frenzied asset buying is definitely a good thing. Especially as the American dollar is strengthening considerably. South of the border, the Fed looks like it might be reversing its recent deflationary actions, where it had sold off a surprising 10% of its assets. Maintaining the “boom” phase of the business cycle requires an ever-increasing rate of monetary expansion. So these actions will put huge strain on their respective economies. It often takes about a year for the effects of monetary policy to really be felt throughout the system. If the stabilization path continues, then Canada will probably go into a recession later this year. During the 2008 financial crisis, the Bank of Canada intervened with an unprecedented 50% expansion of its balance sheet to a total of nearly $80 billion. This was done by creating money and purchasing assets from the big banks in order to add liquidity to the market. By mid-2010, they had unloaded these emergency acquisitions and their balance sheet returned to pre-crisis levels. But now, after years of growth, the Bank of Canada’s balance sheet is bigger than ever. The BoC holds nearly $90 billion in assets. But the crisis is over, isn’t it? The Bank of Canada is trying to keep the Canadian dollar down and interest rates low. They are acting like the crisis is not over, or like another crisis is waiting to emerge. Is the Fed going to “taper”? In other words, will it slow the rate of monetary expansion? When will the Fed do this? That’s what everyone wants to know. As the central bank for the world’s biggest consumer, the Fed is especially important. Their actions have a major effect on the actions of other central banks. The Bank of Canada’s policy is in many ways a function of the Fed’s. Canada’s head central banker Poloz will not rock the boat. He fears price deflation. The central bankers in Europe and Britain are explicitly committed to inflation. More and more central banks are joining to cause of money printing, like Japan and Australia, yet the Fed seems to be a bit of a wild card. That’s because because of Bernanke’s remarks on June 19, where he appeared to raise the Fed’s unemployment target from 6.5% to 7%. He suggested the Fed might slow its bond purchases sooner than previously indicated. Bernanke went out on a limb and changed the target numbers for unemployment in his speech from what was written in the FOMC report. Which sort of goes without saying. Of course the Fed plans to execute its promised “exit plan” when the economy gets better. That’s the whole idea behind extraordinary measures like quadrupling its monetary base since the 2008 crisis with QE 1-3. So what’s the big deal? Other than Bernanke’s 7% comment, the FOMC has been very clear about what it plans to do. The position in the June 19 press release was unchanged from their March press release. The March release was the same as the January release. Literally the same — word for word. In these press releases, the FOMC has been explicit. The Federal Reserve will maintain its current policy of QE if the US unemployment rate remains above 6.5% and price inflation remains below 2.5%. All this debate over whether the Fed will “taper,” and all because no one seems to read what the FOMC says. A few FOMC members said maybe they should taper later this year. But unemployment is not falling fast enough. Price inflation is not rising fast enough. The Fed’s policy is unlikely to change. Even if it does change, and they slow the rate of monetary expansion, they will be forced to intervene again. No one mentions that there was tapering after the previous QE’s. Heck, they didn’t just taper in 2012: they actually deflated slightly. But these little taper episodes don’t last. They simply led to further expansion later. So why not a little bit of tapering after QE3? But that will eventually necessitate QE4. When central banks begin slowing their monetary expansion, the correction will manifest and they will intervene again in desperation. Despite this reality, economists, investors, and financial reporters are obsessed with rumors and hypotheticals because they do not understand central bank policy. The spastic reaction of investors was very interesting. Markets fell. Yields shot up quickly as a massive $80 billion was pulled from bond funds in June. Gold briefly fell below $1200. Clearly this illustrates that this economic error cycle is perpetuated entirely by faith in central bank bureaucrats to keep the money pumping. Which is, by the way, exactly what the Austrian business cycle tells us. You can quite clearly see how the Fed’s expansion is correlated with stock market performance in the last few years. 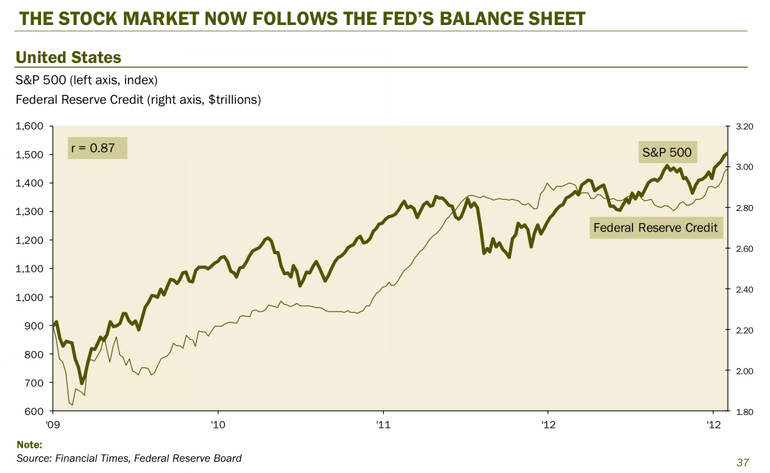 Any time the markets have been worried, the Bernanke Fed has stepped up to deliver QE. I don’t think the Fed is communicating any kind of serious change in policy. And regardless of what they say, they are completely trapped by their own policy. The Fed cannot pull off a smooth “Exit Plan” with that monster they call a balance sheet without causing a crash far more vicious than 2008. Is there any way the Federal Reserve could avoid this? Actually, yes. Their asset sales would have to be offset by the releasing of commercial banks’ excess reserves into the economy. Currently these reserves are massive, corresponding to the Fed’s expansion. If the Fed stopped QE entirely and started selling assets, but the banks lent out their excess reserves, you wouldn’t even notice the Fed’s exit. In fact, there would be price inflation. That’s because the fractional reserve process could generate nearly $10 trillion in new money out of those excess reserves. They are not lending now, so why would they want to lend it when the Fed is selling assets and therefore bringing about a recession? The banks are hoarding their excess reserves now due to extreme uncertainty and impaired balance sheets. They are less likely to lend those funds if the Fed tapers. But what if the Fed tapers and stops paying interest on excess reserves? Yes, the could do this if they wanted. This is a relatively new policy implemented in 2008. But halting this would have little effect. The banks earn almost nothing on their deposits at the Fed: close to zero percent. Going from almost-zero to zero will be insufficient motivation to lend, especially when the economy is expected to slowdown. Better to make zero return than risk losing 5% or 10% or more when the economy goes bad. But what if Bernanke went further? He could charge the banks fees and penalties for having too high a level of reserves. I do not believe he will do this because the banks would not like it. Due to counter-party risk and the danger of short-term creditors doing a bank run on a major institution, it’s least risky for the banks to hold their reserves at the Fed. Another reason why he and other central banks will not force their big banks to lend: they fear massive inflation would result, and no one wants to deal with that. Bringing it under control would bring about a crippling depression. An interesting possibility that should be considered is the Fed reducing the rate of QE3 just before Bernanke departs in Feb 2014. They could then safely blame him for any negative effects which follow. If the Fed announces a reduction in QE in September, that would fit with this scenario. However, I do not believe they will do this. Bernanke wants to ride off into the sunset without any additional controversy. He is not even speaking at the Jackson Hole meeting this summer, due to “personal reasons.” He wants to get out his position stealthily rather than in a flurry of disputation. He doesn’t want to push a tapering policy that will reflect badly on him as he leaves his position. And what’s true of Bernanke is true of all the central bankers — none of them want to look bad in front of their friends. So they will continue to inflate. After the NASDAQ bubble exploded and the US went into recession, Alan Greenspan pumped money into the economy to generate a new boom cycle. Over that time, the economy responded to the resulting misshapen financial markets with the formation of a housing bubble. Greenspan departed and Bernanke began to raise rates. The result was the 2008 crash, during which Bernanke & Friends carried out an unprecedented expansion of the monetary base. Another boom period was generated. The US stock market is again making all-time highs, optimism is much more widespread, and all forecasts and experts seem to agree that the recovery is robust and genuine. This means we are in the economic danger zone. The Fed’s 100-year pattern of propagating booms and busts will continue either until they crash the economy by selling assets, or a monetary crisis arises that they cannot control. The Fed may tinker with its money supply here and there, but we are a long way from any “exit plan.” Until then, don’t count on any real tapering for any significant amount of time.